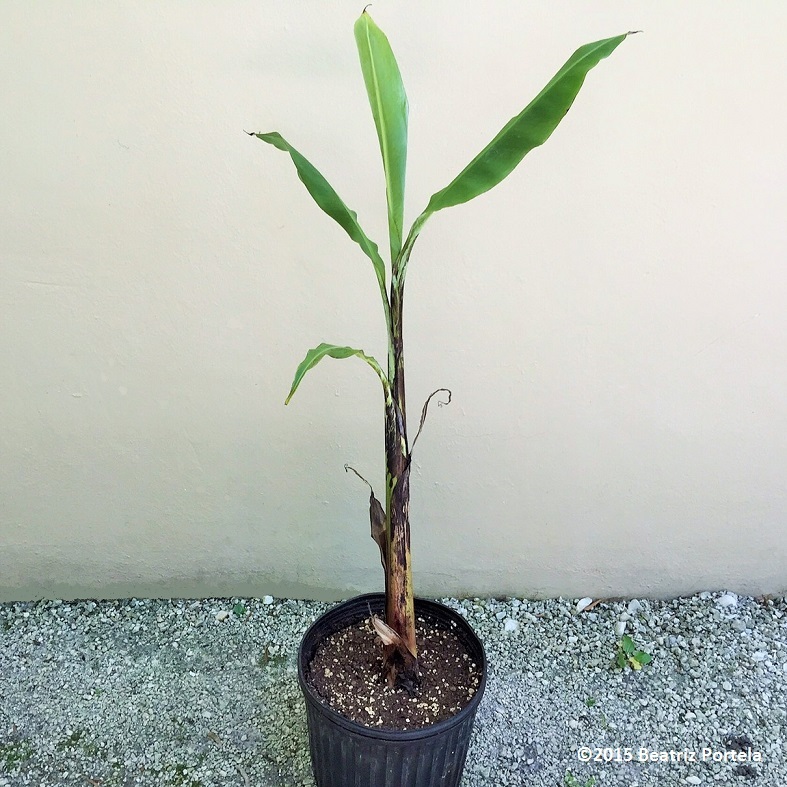 Today I potted a Banana Plant for my friend Hilton. He moved to his house in December; and like me, he’s been more preoccupied with getting his garden in order than the inside of the house! I had posted a picture of Hilton’s Guava Tree a couple of weeks ago. This Goldfinger Banana I’m giving him is a shoot I cut off from my mature plant. This is the best way to propagate a banana. Once planted in the ground it will grow to approximately 14’ tall and should fruit in approximately 15 months. I had planted mine (the mother plant) 15 months ago. It was the first plant I purchased for my house before I even moved here. It is now beginning to grow its first flower spike, which will soon turn into a bunch of bananas. Yay! Oh, to live where a banana tree can be planted. I can’t imagine. My dad and I both loved bananas and had long rambling conversations about their pleasure. To this day, I think a day without a banana is not a good day. This non-gardener is still enjoying your expertise with plants. I appreciate learning about this subject that I am so ignorant about. (I do know grammar. And that was not an example of good grammar.) I appreciate learning about this subject about which I am so ignorant. Is that better? Not much! Thank you so much Oneta! Ok, I’ll give this a bash… No 1 in the picture looks a little bit like no 8 which I think is Parsley. No 3 – Lemon Grass or Garlic Chives, No 4 -Lemon Balm or Mint / Spearmint, No 5 – Rosemary, No 6 – Sorrel or maybe Basil, No7 – Thyme, No 9 – Dill or Fennel. As you can see I gave myself some options as to what they may possibly be 😉 I love the way they have been planted.